3 for Intelligence: Potential Dark Angels codex cover leak??? I saw this over on dakka and they are saying this might be the 6th edition cover. I find it doubtful as there are only dark angels on the cover! 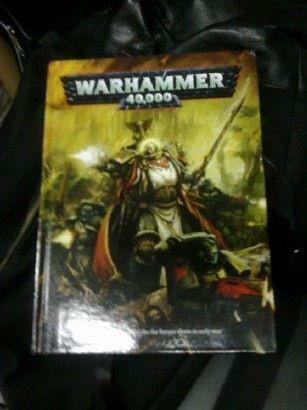 The picture is kind of crap, but it is obviously a hard bound book with multiple Dark Angel marines on it. Green armor and red bolters as well as the trademark DA power sword the main guy on the cover is holding pretty much all point to DA. Does this mean that we will see hard cover 40K codexes? Does this mean that DA is closer than everyone had thought? Does this mean that I can finally dust off my robed marines and have a toga party?!?! Only time will tell. Until then, enjoy your conjecturing! I am pretty sure hard cover codexs are for sure, which is cool with me. I like the fantasy army books and full color codex is win. As for the Toga party, do you really want to play another power armor army for a whole edition? Looks like a rulebook to me, especially since it doesn't have the words Dark, Angel or Codex anywhere visible on the front. While GW are retarded, they do tend to make sure certain things are relatively clear. That being said, I think its a really cool cover and clearly its Dark Angels on the cover. Very odd that they would be on the front of the main rulebook though. Maybe its two sided, DA on one and Chaos on the other, to tie in to the Starter? I dunno. I was pretty dubious that it was the rulebook, but now that I know that there are going to be other editions of the rulebook, I'm a little more sold. It could very well be the collectors edition or some such. Yeah, it is pretty obviously dark angels. I guess the confusion comes from the fact that the only dark angels anyone sees any more are the kind in terminator armour.